Cereal treats brought to a whole new, fun, colorful level! 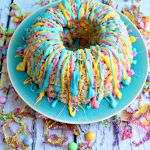 Made in a bundt pan, and loaded with colorful spring M&M’s candies, and drizzled with pretty pastel candy melts, this cake is perfect for Easter, or any Spring celebration! A fun, easy project to do with your kids, and grand kids, too! I don’t know about you, but as a kid, I ate what seems to be thousands of rice krispie treats. Because they are so easy to make, we learned to make them by ourselves pretty early on. Between my brother and I, we could easily go through a batch in one afternoon! We eventually discovered the art of putting M&M’s in with the cereal – oh, my! They went from good, to AMAZING! Have I ever mentioned that M&M’s are my favorite candy? Now that I’m the mommy, I’m always looking for fun, seasonal treats for my kiddo. While strolling through Target, I discovered they have White-chocolate Easter M&M’s!! How cool is that? These were the perfect addition to add to my Spring Krispie Cake! FYI – The regular milk chocolate M&M’s are just as delicious as the white chocolate, and work just as well. 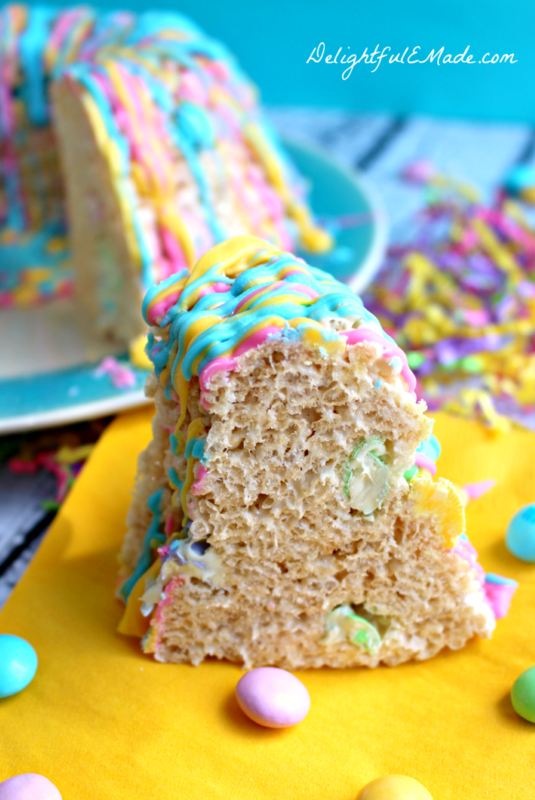 The Easter M&M’s and some colorful candy melts, elevate this regular batch of krispie treats to a whole new level. Simply putting the krispie treats with the M&M’s into a bundt pan, and letting it set for a few minutes, helps make these even prettier! 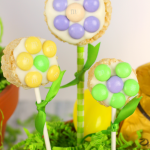 This Spring Krispie Cake is perfect for a spring celebration, a post-Easter egg hunt treat, a cute treat for a classroom clebration, or any other time your looking for a fun and pretty snack. They also couldn’t be easier to make. 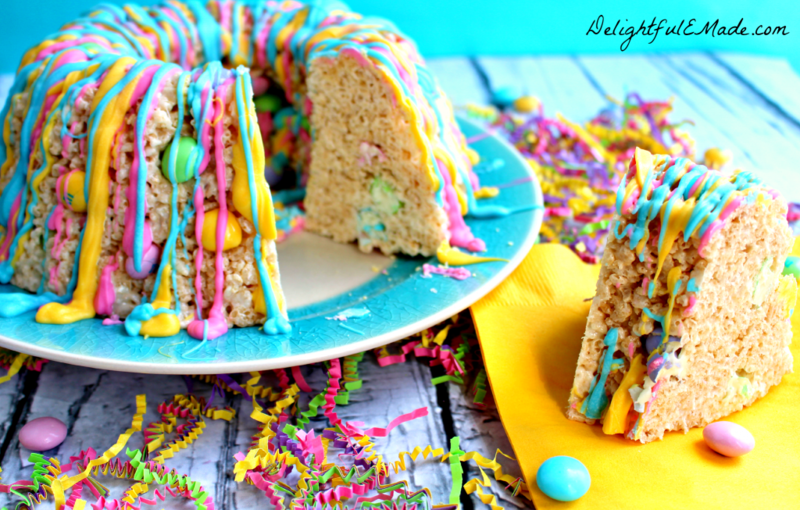 Its basically just your regular rice krispie treat recipe, adding some M&M’s and preparing in a bundt pan. (Make sure you use some non-stick spray, otherwise it won’t come out.) Drizzle with the candy melts, and your done! Easy, peasey!! 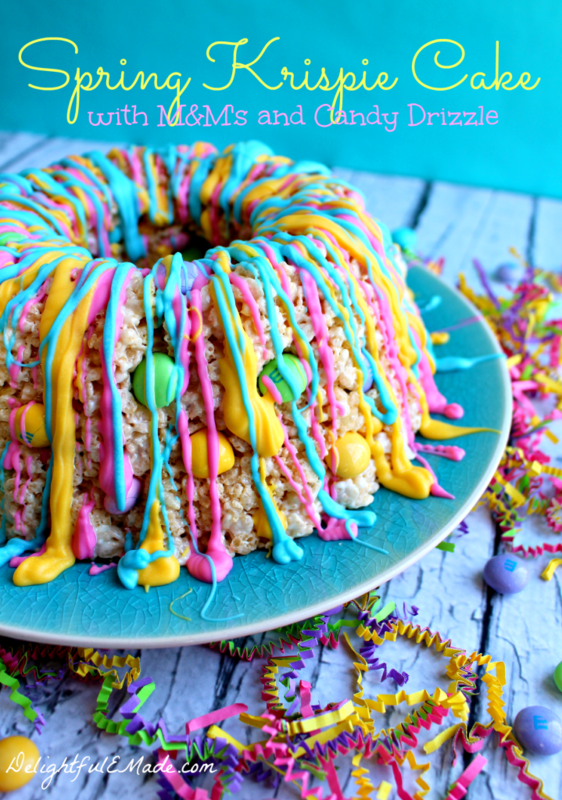 This Spring Krispie Cake is perfect for a fun, springtime snack! Adults and kids will love these! In a bundt pan, generously spray with non-stick cooking spray. Set aside. In a large microwave safe bowl, melt the butter. Add the marshmallows, and toss in the butter to coat. Microwave for 1 min, 30 seconds until the marshmallow are completely melted. Stop at 45 seconds to stir. Add the cereal, and stir until the marshmallow and cereal is combined. Add 3/4 cup of the M&M's and stir until dispersed into the cereal/marshmallow mixture. Press the mixture into the bundt pan. Let the mixture set for about 10 minutes to harden. Invert on to a plate. 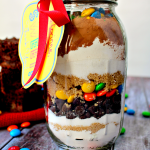 Press the remaining M&M's into top of the cake where needed. Melt the candy melts in a small microwave safe bowl, on 30 second increments until completely melted. Drizzle over the cake. Do this with each color you wish to use. Let the cake set for about 30 minutes or until the candy drizzle hardens. Slice and serve. I hope you get to enjoy this fun, springtime treat with your friends and family! This looks fantastic and is amazingly creative. Great job. Holy moly! Is this an awesome cake or what? I don't know which would like this more - my eyes or my tastebuds. So creative and fun! Wow this turns rice krispies into a fancy dessert. Would love for you to share it on Friday Pin Fest link up. This is so pretty! 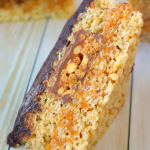 I'm planning to use a Rice Krispies cake for my daughter's third birthday this year and just might have to decorate it like this. She'd love it! Erin, this is beautiful and amazing!! It's just screams happy and spring! Thank you so much for sharing at Best of the Weekend - will be pinning to our party board! Have a wonderful weekend! Erin, what a fun candy drizzled treat! Forget about when we were younger... I still eat almost a whole pan by myself! Love these! 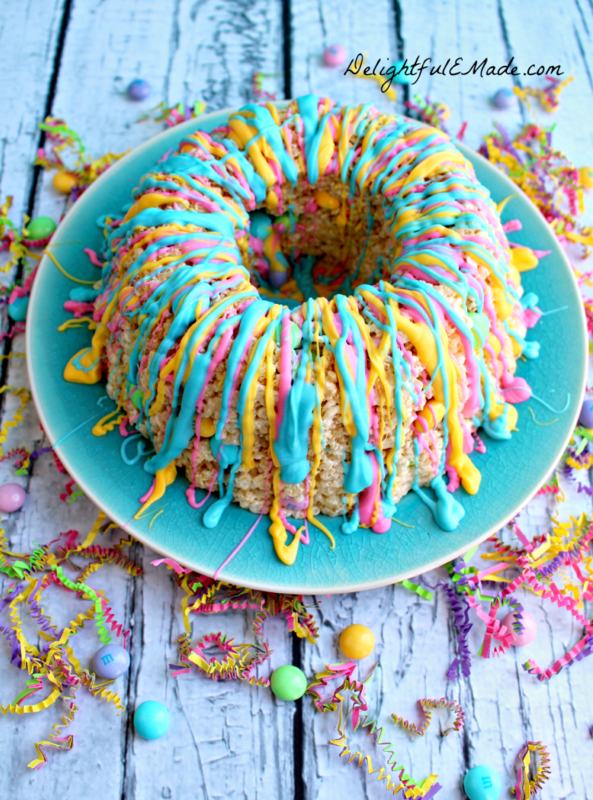 Thank you for sharing this colorful treat with all of us at the Show Stopper link party! This looks good, maybe to good. 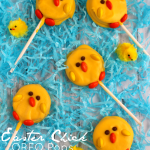 Would have to make these in little bundt pans and then give them to my grandchildren for easter. I could eat the whole thing. This look amazing! Too pretty to eat! 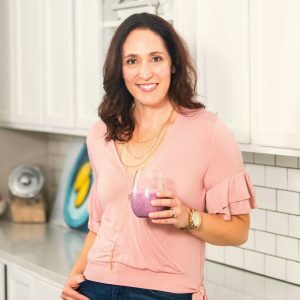 I just wanted to let you know that I am linking to this post on 4/3 at Simply Creative Living if you don't mind. Don't mind at all. Thanks so much, Alyssa!! Congratulations!! 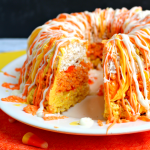 This awesome Cake was the most viewed at Freedom Fridays With All My Bloggy Friends this week!! Hugs and thanks so much for sharing!! Making in mini-bundt pans would be a fantastic idea! Would be really cute, and the perfect treat for each person. Thanks so much, Tavette! 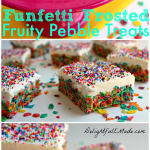 So colorful, easy to make and something the kids will love. Well done. Pinned! Thanks for sharing! I can't wait to make this for the children in my class. They're gonna love it! What a creative idea perfect for spring! Thanks so much for sharing @ Oh My Heartsie Girls Wordless Wednesday! This cake is gorgeous and so easy! PERFECT! Thanks for the recipe!!! Wow that is all of that and then some. Great recipe and thanks for sharing with us on Throwback Thursday & can't wait to see what you’ll bring this week! Wow this is sooo cool! I love it! And I need one!